The Redcat stage looked like a jungle: gongs hung from stands, electronic cables snaked between the legs of snare drums, and groups of instruments claimed distinct territories amidst the mess. Eight tablas waited on a makeshift altar at center stage, perhaps soon to be sacrificed. 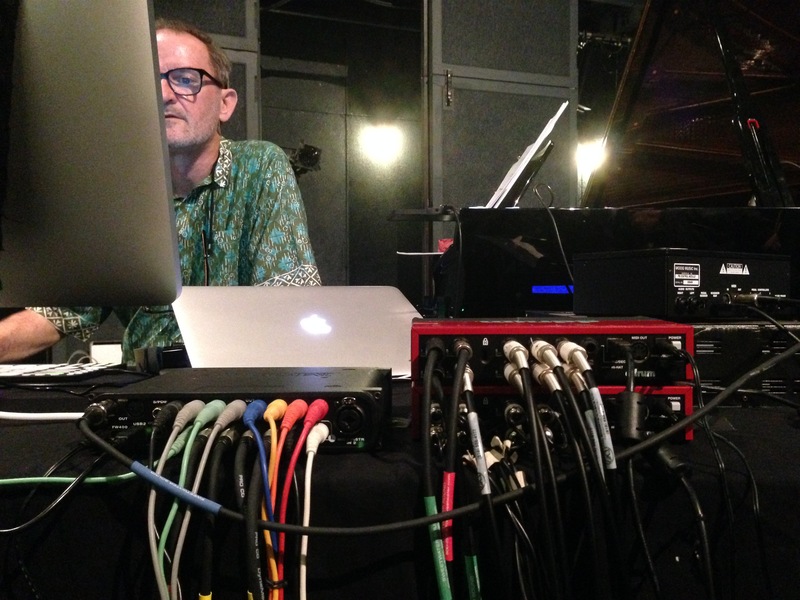 Percussionist William Winant entered the fray fearlessly, while David Rosenboom, composer and electronics virtuoso, presided over the performance from his computer downstage right. Zones of Influence is one of David Rosenboom’s most complex compositions, written for percussion instruments and electronics in 1984 and 1985. He had Winant in mind for the percussion part from the beginning. Rosenboom’s concept for the interactive nature of the electronics was so far ahead of its time that it took almost thirty years for the piece to reach its full potential. I attended the tech rehearsal on Friday to learn how the piece works. Sensors, placed strategically on the acoustic instruments, trigger electronic sounds in real time so that the percussionist seems to be playing with or against a ghostly other. Placing the sensors on the various instruments proved to be a challenge, particularly on the gongs. Rosenboom, not receiving clear signals on his computer, sent his technical assistant to investigate. Winant pointed out that securing the sensors with tape caused the instrument to sound muted. Zones of Influence is much more than a duo between percussionist (Winant) and electronics (sculpted and performed by Rosenboom, who also played piano and violin). The electronics become a third member of the ensemble, and during the long afternoon of setting up and testing electrical connections, the technology provided some necessary surprise and levity. These moments reminded me of traditional classical music rehearsal where—serious as the music may be—players need to be able to laugh at themselves. Performers spend a majority of rehearsal time correcting mistakes or calling out problem spots; if critical remarks are taken personally, everyone gets tense, and if people are tense in rehearsal, people will be tense in performance. I’ve found that playing with electronics often alleviates the frisson of ensemble rehearsal. Squawks and bleeps might escape from speakers that you thought were muted. A mysterious low rumble might flood the room precisely when you call for silence. Sometimes it’s funny. But no one’s to blame; the sounds are simply ones and zeroes running according to a computer algorithm. There is always uncertainty at an electronic music concert, however, and that’s the simple fact that the electronics might not work. A mic could develop a hiss. A speaker could go out. Levels checked in rehearsal might betray you in performance. The tech rehearsal just happened to be on Halloween, and at times I sensed that Rosenboom’s technical team intended to lure the ghosts out of the machines in preparation for the show. Zones of Influence is a child of the 1980s; for people familiar with electronic music, there’s no mistaking its soundworld. The modulated pitches are sometimes familiar, yet they buzz as if being hummed between two pieces of wax paper. The filter sweeps suggest that we all take a trip to outer space. It’s a melodious cacophonous assault on the ears. And yet, it was interesting to hear the composer muse to himself: he organized his thoughts as if he were about to play a Beethoven piano sonata. Rosenboom and Winant worked through the piece with a fine-tooth comb, demonstrating patience for “starting over” and “doing it again.” These are the unglamorous realities of being a performing artist. The music may invite poetic and comparative descriptions after its last notes dissolve into applause, but the process of getting there is more prosaic. 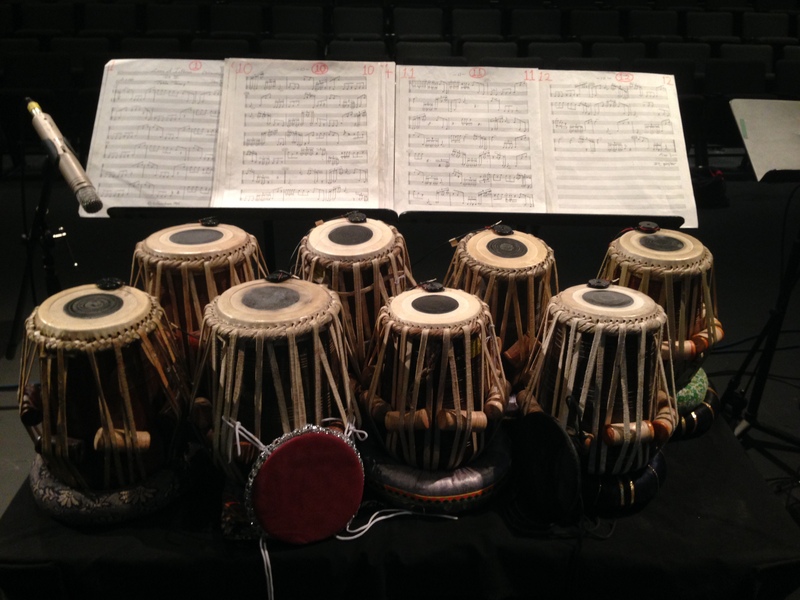 Rehearsal—whether you play string quartets or symphonies or an array of gongs that crackle with electronic noises when you hit them—isn’t always about working toward expressive communication. It may seem that a performer’s job is to play beautifully, to produce sound with emotion and style, but there is a meta level to performance that I imagine eludes most listeners. And rehearsal gets to that meta level: players learn the lay of the land, acknowledge the obstacles ahead, and plot the potential best course of action. Rehearsal is about method rather than metaphor. By understanding a composition’s interlocking and related parts, a performer will find the ease and spontaneity to play in ways that move and excite the listener. Winant and Rosenboom have been playing this piece together for thirty years. Winant joked that even though his part hadn’t changed in three decades, he’d devoted the past three weeks to it as if learning it for the first time. I knew the joke was on me when I observed how he and Rosenboom anticipated each other’s needs in rehearsal. The score, and all its intricate notations, was never in the way. As they tested the four mics hovering over the two marimbas, Rosenboom hardly needed to call out what to do next. Winant worked the entire range of the marimbas without pause, both practicing and freely improvising on the piece. In a way, their camaraderie seemed as important to the realization of the piece as their individual technical and technological proficiencies. At rehearsal, they talked to each other in the ways all classical musicians do, about making eye contact, giving each other enough time to move from one section to another, and not rushing through a crucial page-turn. The verbal planning was enough; never in the performance the next day did their coordinating seem forced or obvious. At times, the performance felt like a bacchanal as Rosenboom and Winant celebrated the sheer physicality of performing the five-part, ninety-minute piece live. The music manifested with an involuntary magic, the same kind of magic you might have heard around the corner inside Disney Hall.